Now, this is important. Once the battery is removed, everything is gonna slam into emergency mode. Once we have it, we gotta move quickly, so you definitely need to get that last… Or we could just get it first and improvise! Today’s the day! The snow is falling! And we are officially starting the Sim! The sun rose with the symphonic sounds of the Apollo 13 soundtrack echoing through the habitat. It may be the last day of the year, but it is the first day of real Mars living for our crew. Through the white noise of the water pump, crew “singing” (a.k.a. snoring), and the occasional bumps in the night of members discovering different walls and corners surrounding their bed, the crew awoke refreshed and ready. Sleep was especially important last night. Today, the entire crew would perform their first Extra-Vehicular Activities (EVAs). 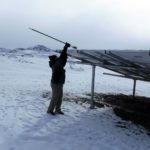 The day began with sweeping and shoveling of snow on the porches, tunnels, and solar arrays of our home. This proved fruitless as it snowed again in the afternoon, but at least we were safe from ice for the first few hours. This was followed by our last MDRS training session on how to drive the rovers. Now the real work begins, but what does a “full simulation” entail? Full simulation includes limited communication with the outside world, standing in an air lock for 5 minutes to depressurize the entryway when exiting the habitat, and donning our suits anytime we leave the safety of the habitat. Essentially, it’s continually asking the question “Is this something that would be done on Mars?”. The EVAs were a wonderful learning opportunity as we explored the capabilities of the rovers and tested the comfort of the suits. Flurries melted onto our helmets as we traversed the “Marble Ritual” landscape. Each member danced among the painted, hanging bunt pans, miraculously not hitting any of the poles with our limited vision in the clunky space suits. We found a rock with holes that looked like a smiley face, crunched over clay and dirt to test the GoPros on the expansive mountain landscape, and quickly returned to the warmth and comfort of the habitat. The crew is as green as can be with only one veteran Martian on board, but we are also excited, hard-working, and determined to make the most of our time on Mars as we learn the ins and outs of performing an EVA. If you thought the Great Nutella Crisis of Crew 202 was traumatic, you haven’t heard of the even GREATER Tea Kettle Crisis of Crew 202. Today the tea kettle broke… leaving us to boil water on the stove like pilgrims. It’s a true tragedy here on Mars, but I think the crew will power through it. An exciting end to an exciting day as the crew prepares to celebrate New Years Eve on the Red Planet. The commander is cooking baked ziti which intoxicates the room with smells of tomato, basil, and garlic. It is almost as powerful as the aroma of chocolate brownies by our Crew Engineer emanating from the toaster oven. As we prepare the 2019 tiaras, blow on the noise makers, and pull the tab on poppers, we reflect on the previous year and the new year to come. The meetings, preparations, and packing that has brought us to this moment as a new crew family, and the incredible adventure that awaits us in the new year. When midnight on Earth strikes at 0.5317 Martian years, we will hold our loved ones on the pale blue dot in our thoughts and wish everyone back on our first home a Happy New Year. Purpose of EVA: familiarization with suits, rovers, communication procedures, testing the ability to use scientific equipment in EVA conditions. Narrative: EVA 2 crew successfully reached the Marble Ritual. On site EXO attempted to use some of the scientific equipment. It was partially successful due to freezing wind and blizzard. Familiarization had to be cut short due to deteriorating Martian weather. Its about to be 2019 and we are celebrating with a large meal! Fortunately, the greenhouse can provide with some herbs and mixed greens for the feast! 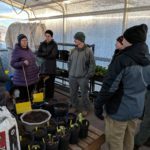 Some plants were harvested and watered. A majority of the plants are looking good. Some of the carrots’ stem are not rigid and falling over. Notes on non-nominal systems: Two-piece suit #3 and one-piece suit #7 won’t turn on even when plugged in; Electric tea kettle in kitchen does not turn on even when we plugged it into a different outlet; Hot water heater ignitor doesn’t work so there is not hot water in the Hab. Notes on ATVs: All VIN numbers on ATVs were located and registration papers were found for one. 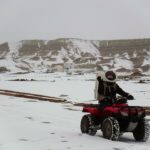 YODA, Honda, and two of the 350s were started and driven today, but they were very hard to start in the cold. The Honda, YODA, and 350.1 remain at the Hab for a geology EVA later in the rotation. There are two other 350s that are being worked on since one battery doesn’t work and the other is making a weird noise. One of these 350s will be brought to the Hab later. General notes and comments: Spent the first half of the day training for EVAs and ATVs. The second half of the day was spend doing two EVAs, both to Marble Ritual and back. Questions, concerns and requests to Mission Support: I have not heard anything about the two-piece suit #3 since it was reported about 2 days ago. Summary Title: So it begins..
Mission Status: The crew is now in full simulation. We are on Mars, though it looks like we landed somewhere close to the polar cap! 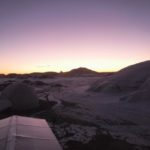 Sol Activity Summary: What an exciting day here! We woke up to an unexpected 2 inches of fresh snow, in a winter wonderland. 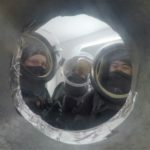 Since we still had to complete our training with Rover driving and EVA suits training, we were not in simulation yet, so we could sweep and shovel the tunnels, the front porch, and the solar panels without wearing suits. 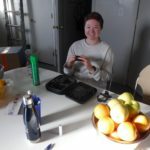 The Rover training got all of us slightly cold, so we decided to get back in the habitat and enjoy some hot chicken noodle soup before completing the training. In the afternoon, we finally celebrated the beginning of our simulation, which started immediately with two short EVAs that gave every crew member a chance to experience how driving and hiking in a heavy suit feels. What a great feeling for me to be back into my space suit. I am also lucky because the two-piece suit fits me perfectly! But the top for me today was to look at my crew mates during the airlock pressurization, and outside in the field: in their eyes and their enthusiasm I saw a reflection not only of me last year, during my first experience in EVA, but also the same joy that I feel this year. It is good to be here, and it is great to see a completely different face of Mars, an icy and snowy face. 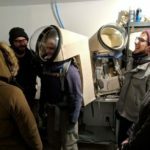 But the cold did not stop us, each member of the crew has aspirations to go to space or to help our effort to reach Mars, and some discomfort is a small price to pay in exchange for being a part of this! Look Ahead Plan: Due to the large amount of snow, we will not attempt any EVA tomorrow (except for engineering EVA to keep our front porch clean of snow), and we will spend an amazing New Year’s Day getting to explore our home for the next two weeks. We will start a few outreach and crew conditioning projects, and enjoy the day on Mars! EVA: Two short EVAs to Marble Ritual, to get the crew used to EVA protocols, communication protocols, and the joys and pains of activity in a space suit. we will look into that tomorrow. 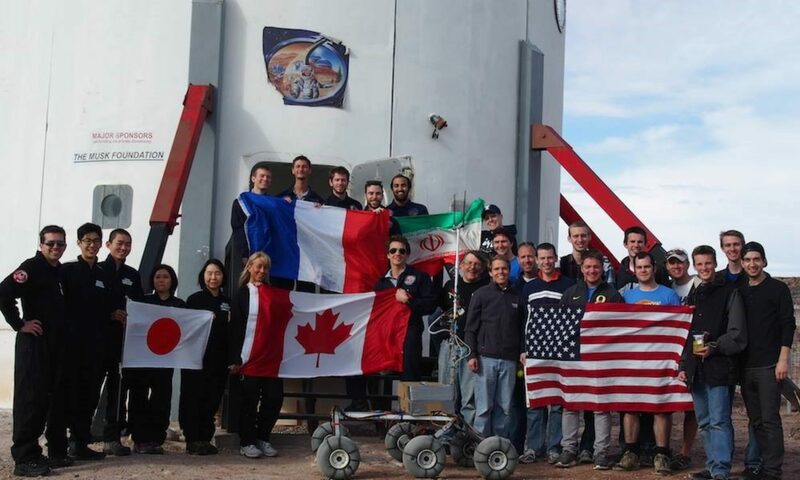 MartianMakers is the second all-Purdue crew at MDRS. 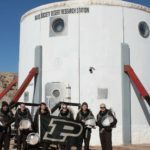 Enthusiast and grateful for the first experience of Purdue students and alumni at the station, and eager to bring our tiny contribution to the advancement of research for human exploration of Mars, we organized a crew with one veteran of MDRS and five bright young rookies. 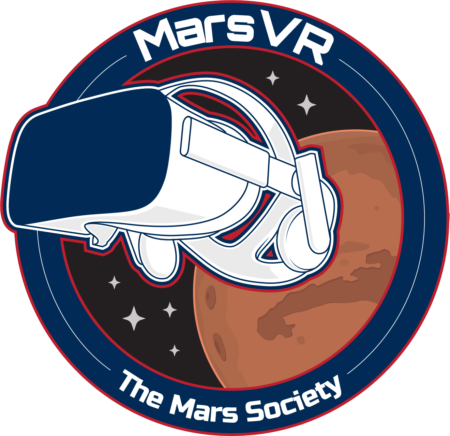 Crew 202 will perform various research tasks related to human exploration of Mars: some of them will be performed in the laboratory, while others require Extra Vehicular Activities (EVA), thus adding realistic difficulties to the task. This way, crew members will not only be collecting data for their research projects, but also identifying potential issues and difficulties with performing tasks while encumbered by space suits in a harsh environment. 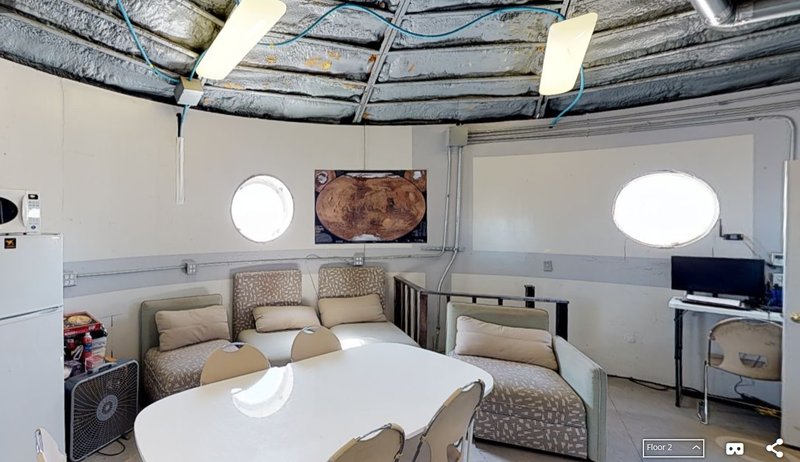 A third important aspect of the mission will be the experience of living together in a small habitat, with all the consequent psychological and social aspects that will allow the crew to challenge themselves in a realistic astronaut situation. • Keeping the highest level of fidelity and realism in the simulation. Earth analogs cannot reproduce Martian gravity and atmosphere, but the crew will keep every other aspect into consideration. 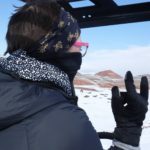 This includes safety and research protocols, definition of roles and daily schedule (with ample space for personal time), EVA protocols and difficulties, communication protocols, fruitful collaboration with the program director and mission support, and adaptation to limited resources and environmental difficulties. • Complete outreach projects. Public relations and outreach began before the mission and will continue after it and includes outreach to the general public about analog missions and their importance, outreach to students about the crew research, and media release through Purdue university and other channels. • Lay the foundation of continued collaboration of Purdue crews with the MDRS program. • Following the mission, supporting MDRS with useful products and manuals for future crews. Description: Extravehicular activity is an extremely demanding task, physically and psychologically. EVA exposes astronauts to significant physiological stress. Multiple studies have shown that human decision making is strongly influenced by stress. It has been demonstrated that stress changes participant’s attitude towards risk which in case of EVA may lead to dangerous consequences. This particular study is designed to investigate the possible influence of physiological stress experienced by participants during simulated planetary EVA on their decision-making. Different conditions of stress will be simulated (no EVA, regular EVA, some level of stress after EVA). The amount of stress will be evaluated through a procedure approved by Purdue’s Institutional Review Board, involving collection of saliva and appropriate measurements. Rationale: While is it important to spread our research among experts and professionals, it is equally important to have the younger generations informed and interested in what we do! United States astronauts train for years. You have twelve days. First and foremost, we would like to thank Crew 201 for their hospitality in introducing us to our new home! We had a wonderful evening with our new friends and wish them the best in their future endeavors. Our first couple days on Mars have been filled with training. Safety, Sim, Science, Media. A few important takeaways included: EVA suits – treat your life support systems with care, Green Hab – fresh food is essential for happiness, treat them with care, Habitat – our new home is not only a place to work, but a place to live… treat it with care. After going through the initial day of training, we encountered our first crisis: The Great Nutella Crisis of Crew 202. Our commander could not initially find the Nutella jar we had been promised. What else were we going to spread on our fresh made bread? What other spread was going to provide enough energy and cheer in the morning to sustain us through the day? Thankfully, we found it. Unfortunately, it was the standard size of Nutella. A jar our six crewed team could easily scarf down in one breakfast. Rationing will be tough, but it is a reality when living on the Red Planet. The sweet hazelnut spread will be a treat savored, and sorely missed once gone. The second day, we woke up to send off Crew 201 back to Earth and to their loved ones. Our first sunrise on Mars was breathtaking. 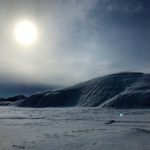 Watching it rise above the red plateaus and rolling hills, glistening over the snow, was an incredible sight to see and so began our takeover of the habitat. Breakfast was casual with the crew’s selection of oatmeal and cereal. Turns out, fake milk is better left to the later, more desperate days of the mission. We have several organizations and individuals to thank for launching us on this mission, so part of the day was spent suited up and taking photos to send upon our return. This was the first time our entire crew was suited up, ready for action. Our family photo is all smiles, and they’ll only grow when the real Extra-Vehicular Activities (EVA) begin! We are blessed with a bread machine on Mars. The French bread today had a warm, crunchy crust and a soft, fluffy interior. It was delightfully paired with re-hydrated butter and olive oil. We are mostly likely to run out of flour quicker than anything else as this becomes a daily ritual. As the crew sits down for our first dinner, we are left with the testimony that “Everything on Mars has a personality”. We are fresh, optimistic, and looking forward to exploring the personalities of our new home and our new planet!